The Fenway Center project, which would include 550 residences, retail stores, offices, and parking using some air space over the Massachusetts Turnpike, is in jeopardy because the developer cannot finalize a lease with the state transportation department. The $450 million Fenway Center development over the Massachusetts Turnpike in Boston is in jeopardy because of a stalemate between the developer and state officials over a long-term lease for the property, according to a source with knowledge of the matter. Unless the two sides reach a leasing deal for the massive residential, retail, and office project soon, developer John Rosenthal’s investment partner will pull out, said the source, who was not authorized to speak publicly. That would doom another project involving turnpike air rights to failure, undermining officials’ long-held goal of transforming the real estate into a string of tax- and job-producing office, hotel, and residential buildings. The last successful air rights project in Boston was Copley Place, which was built in the early 1980s using $19 million in federal grants. Rosenthal, who has been planning Fenway Center for over a decade, declined to comment on the negotiations. A spokeswoman for the Massachusetts Department of Transportation said talks are progressing, but had no deal to report. But the person with knowledge of the Fenway Center negotiations said Rosenthal and transportation officials are deadlocked over changes Rosenthal’s investment partner wants to make to the proposed 99-year-lease for the property. The project, already approved by Boston regulators, calls for construction of 550 apartments, retail stores, parking garages, and a 27-story office and residential building near Fenway Park. Work is already underway on a new commuter rail station at the edge of the parcel, which is centered on a canyon of parking lots between Beacon Street and Brookline Avenue. The outcome of the current negotiations not only holds major implications for Fenway Center, but for the future of air-rights development along the turnpike corridor in Boston. City and state officials have long sought to develop the property to generate new revenue and knit together neighborhoods divided by the highway. But recent efforts have ended in high-profile failures, such as the $800 million Columbus Center condominium, hotel, and retail project, which fell apart in 2008 after a decadelong struggle to obtain permits and government subsidies. The project’s backers lost tens of millions of dollars in the deal, and one of its executives, Arthur Winn, later pleaded guilty to making illegal campaign contributions as he was trying to gain government support. While Columbus Center suffered from an array of problems — some of its own making — advocates for development say the demise of another major air rights project could scare away future investment in those properties. Roy, the transportation department spokeswoman, said in a statement that plenty of developers remain interested in building air rights projects, and that the state remains committed to helping those project move forward. “MassDOT is well aware of and very much appreciates the inherent challenges presented by air rights development, both physically and financially, and is working hard to make such developments happen in the post-financial crisis environment,” said Roy. 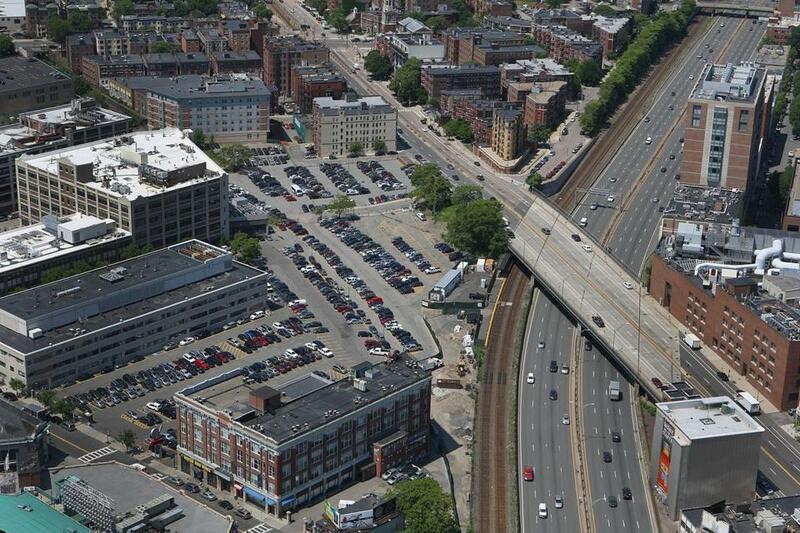 State and city leaders renewed a push to build over the turnpike in the late 1990s, commissioning a study that envisioned a mix of hotels, offices, residences, and public parks spanning the highway between Brookline and Chinatown. Since then, however, none of the projects has been built. Following the Columbus Center failure, Rosenthal’s project was the next in line to become a reality. The project moved to the brink of construction earlier this year following the dismissal of a lawsuit by an abutter, but it soon became bogged down in negotiations over the lease. At the heart of the matter is whether the state should agree to accept less money in lease payments so it can reap the broader benefits of the complex, including construction and permanent jobs, tax revenues, and a development that would improve a scrubby section of property in one of the city’s most visited neighborhoods. The two sides had previously agreed to a rent credit to help fund the extra costs of building a deck over the turnpike to support Fenway Center’s buildings. But Rosenthal’s investment partner has sought to renegotiate some terms of that deal. The person familiar with the matter said Rosenthal’s partner wants the state to subtract the cost of building the deck from the overall value of the property, which includes several acres along the turnpike. The state wants lease payments to be based on full market value for the land parcels — a proposal the developers believe would render Fenway Center financially infeasible. The parties have not reached a deal despite weeks of negotiations, leaving Rosenthal at risk of losing his funding unless the matter is resolved soon.